Yet another success for our students at the Tech Partnership North Event 2015. 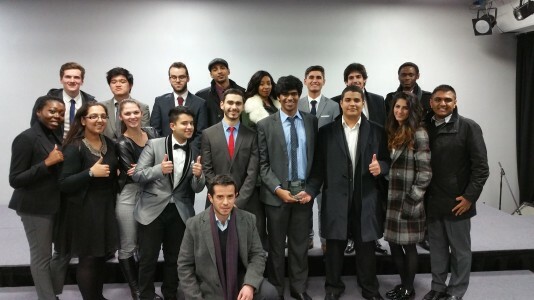 Our ‘Software Engineering for Business’ (SEB) students won 1st prize (£500) in the competition “How would you improve your city with software?”. Our team proposed a solution that addresses the problem of sound pollution in big cities. The judges’ exact words were: “mind-blowing!” and they advised our students to patent their idea ASAP! But the wins don’t stop there, our Information Technology Management for Business (ITMB) finalists won 2nd place (£300) in the competition “How would you use AI in the business world?”. Our team proposed an AI-based solution that would solve problems of supply and demand in the healthcare industry. Again, the judges were very impressed by our team’s work. Competitions aside (wins have become sort of a routine for our students) all employers (IBM, Capgemini, GE, E&Y, Ford, HP, to name just a few) commented on how very impressed they were by our students’ overall presence at the event. Many congratulations to our students and SEB and ITMB programme lecturers, Rachel Appleton and Eranjan Padumadasa, who prepared and supported the students for the ITMB’s annual North Event, and also to all ITMB and SEB students who could not attend the event in Manchester, as they have provided fantastic support to their classmates towards shaping the final proposals through constructive feedback and their community spirit! ITMB and SEB programmes are accredited Tech Industry Gold Degrees by the Tech Partnership (a growing network of employers creating the skills for the digital economy). Tech Industry Gold degrees are defined by employers to provide students with the most relevent technical, business and professional skills that place them in high demand in the tech sector.